The European Health Insurance Card (EHIC) is a travel insurance passport within Europe. 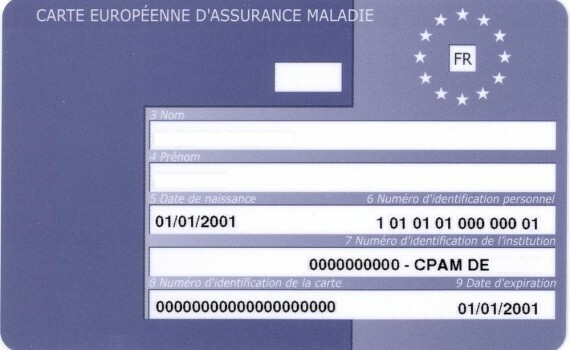 By that I mean if you are resident in European Country A and a member of their National Health Insurance scheme, you can apply for the free European Health Insurance Card and use that in the Euro area for accident, illness and emergency healthcare in European Country B plus Switzerland as you would a travel insurance policy. The reason a European Health Insurance Card is issued is that it is issued by your National Health Scheme. Simply having a passport from a European country does not guaranty that you are a member of the National Health Insurance Scheme in your home country. The European Health Insurance card has no photo, so you may be asked for your passport as an additional verification of identity. It cannot be used for elective or urgent medical treatment, generally speaking anything that you could postpone and have done at home. It also cannot be used to travel specifically for medical treatment. It will cover treatment like kidney dialysis and for other chronic conditions unlike travel insurance that would deem these pre-existing conditions. In 2005 the European Health Insurance Card superseded a number of forms that separately covered truck drivers, international students, transient workers, and tourists. This made the new regime simpler and one card for all thus cutting red tape. Each country has different validity periods for their cards and Romania apparently won’t issue one unless you’ve been a member of their National Health Insurance Scheme for 5 years. So you have to check the specifics of your home country to get the details. There are scams out there where agents will for a fee complete an application for you and check it for errors. They seem to imply in their promotional material that you need them in order to get the European Health Insurance Card. This is false and countries like the UK have issued cease a desist orders but the scammers won’t go away. This card is free and easily applied for.